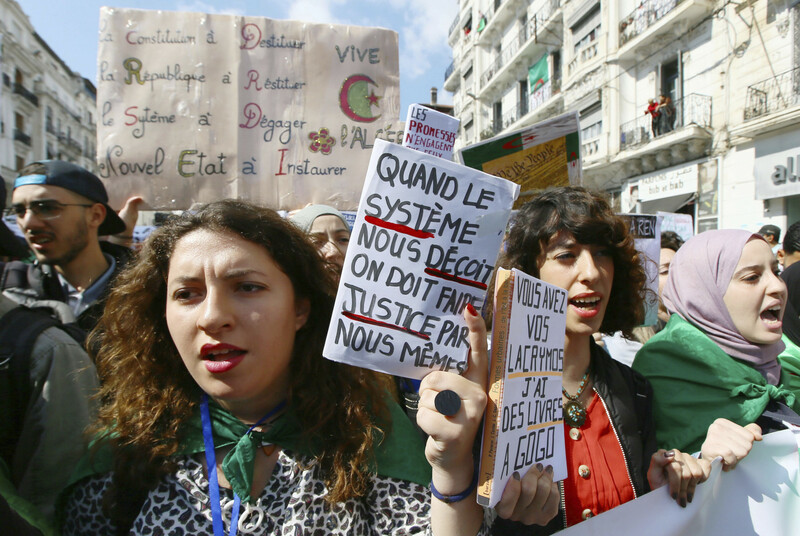 Algiers: Algerians were preparing Friday for the first mass protests since the resignation of ailing president Abdul Aziz Bouteflika, in a key test of whether the momentum for reform can be maintained. Activists took to social media calling for “joyful demonstrations” to “peacefully bring down a dictatorial regime. Opponents of the old regime have called for a massive turnout, targeting a triumvirate they dub the “3B” - Abdul Kader Bin Salah, Tayeb Belaiz and Prime Minister Noureddine Bedoui. Bouteflika resigned late on Tuesday after weeks of demonstrations triggered by his bid for a fifth term in office. He had lost the backing of key supporters including armed forces chief Ahmad Gaid Salah. Bin Salah, speaker of the upper house of parliament for 16 years, is to take the reins as interim president for three months until elections are organised. Before his appointment as prime minister, Bedoui had served as interior minister - or, as the French-language Al Watan newspaper put it on Thursday, “chief engineer of electoral fraud”. Meanwhile, Algeria’s intelligence chief, Athmane Tartag, has been removed from his post, private Ennahar television station reported on Friday. Tartag, a retired army general, was an ally of Bouteflika. One of the leading voices of the protest movement, lawyer Mustapha Bouchachi, called for the demonstrations to continue “until they have all gone”. “Algerians will not accept that symbols of the regime... lead the interim period and organise the next elections. “These symbols of the regime cannot be part of the solution and we have been demanding since February 22 that the whole system, its symbols and its clients, leave,” he added. Protesters are calling for new transitional institutions to be set up to implement reforms and organise free elections. Hamza Meddeb, an independent analyst in Tunisia, said Algeria was entering “a very delicate phase, because the street and the institutions are at risk of diverging”. Geneva-based political scientist Hasni Abidi said “the Algerian street has become has become a new player” in the country’s politics. Little was known, however, about the army’s intentions, he said. Algerian newspapers have focused on the how the military might react in the event of continuing protests. “Will the military institution put all its weight into imposing strict compliance with the constitution... or push for another consensual political outcome?” asked the French-language Le Soir d’Algerie. Despite abandoning his patron Bouteflika who named him army chief in 2004,, General Gaid Salah is still seen by protesters as a key defender of the “system”. The Liberte newspaper said many Algerians could not forgive the army chief for having backed Bouteflika almost to the end. “After the Bouteflika clan, it will be the turn of the armed forces chief to face the street,” it said.